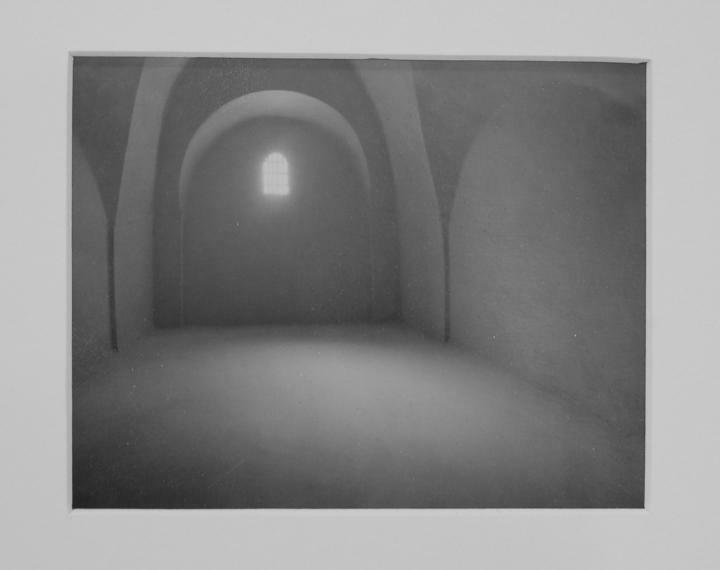 Study for "The Empty Room"
The unique black and white polaroids by Casebere were the final images, the maquettes, that Casebere used prior to pulling his large scale photographs which are editions of 5. New York, World House Gallery, NOT@The Armory Show 2002, 21-25 February 2002. This work is in fine condition and is framed. The dimensions given are for the size of the image. For more than two decades now James Casebere has merged the disciplines of photography, sculpture, installation and conceptual art to form a unique vision of our physical surroundings. Casebere's photographs are two-dimensional representations of three-dimensional table-top sets and models that the artist painstakingly constructs in his studio and eventually illuminates with theatrical lighting. Through the lens of Casebere's camera, these dramatically lit models often, in more cases than not, appear to be actual structures and mimic the appearance of archetypal institutions - home, school, library, prison, asylum - or archetypal architectural tropes - tunnel, corridor, archway, arena - all the while transforming the familiar aspects of contemporary life into extraordinary tableaux.